For Nozaki Haruka, moving from Tokyo to the small town of Ootsuuma was life-changing... but not in a good way. Half a year later, Nozaki is miserable; she is relentlessly bullied by her classmates, who use her as an output for their pent-up rage and frustration. Though she could, Nozaki does not retaliate nor tell her parents, as she does not want to worry them. With this mentality, she is prepared to endure until graduation. But when her bullies put her through a particularly harrowing ordeal, her parents become aware of the situation and allow Nozaki to stop attending school. However, this only instigates the bullies, forcing them to take an irreversible step which shatters her world forever. Now utterly devastated, a burning ferocity begins to swell within Nozaki, one which her bullies can only hope to escape from. I changed my mind a lot of times while reading this manga. The further I read, the creepier it gets. At its core, I still see it as mostly a simple revenge story, but the author sure takes care to insert a lot of things along the way. By the end, you’re left wondering if you’re reading a revenge story or a story about a bunch of crazy loons. I won’t spoil anything, but I will say the story certainly kept the surprises up. Moving aside from that, the only other thing of note is the art. I’m conflicted here – primarily because I don’t know whether the awful art is intentional or not. On the surface, it seems awful primarily because characters often looked like fanged monsters when angry and, when they’re not angry, they looked indistinguishable from each other. At first, I disliked it but, later on, I ended up wondering if the author was using the art to make a commentary on the characters. So…what am I saying? I’m saying I really don’t know how I feel about it. The important part, though, is that I did enjoy reading it. Would I recommend it to others? Yes. Overall, I think it’s a short and enjoyable read. Plus, the fact that it’s so confusing actually lends to its enjoyment, I think. If nothing else, I would suggest it as a fun romp that can be finished quickly. Revenge tragedies have proved incredibly popular throughout the ages. Shakespeare's 'Hamlet' is still studied in institutions all over the world while 'Berserk' is one of the best selling manga series of all time. 'Assassin's Creed 2' is one of the most critically acclaimed video games of the 21st century while 'Gladiator' is among the most memorable live-action films of the 2000s. Good revenge stories are filled with captivating characters, intrigue and the potential to elicit an emotional response from the viewer. Rensuke Oshikiri's 'Misumisou' fails to achieve any of this and then some. It is truly one of the worst pieces of fiction I have ever had the displeasure of experiencing. 'Misumisou' is about a middle school student, Nozaki Haruka, who moves from Tokyo to a small backwater town following her father's new job. Unfortunately, Nozaki immediately becomes a victim of bullying in her new school. Nozaki's trials and tribulations become increasingly severe with each passing chapter until our protagonist reaches breaking point and goes on a murdering spree. Now, the plot in and of itself is fine, if a little simple. Where the series really falls flat is in its execution. Particularly, the crux of the series' problems can be found in its characters. The characters in 'Misumisou' suffer from the same weakness that plagued 'School Days'. That is, the characters are essentially caricatures in a series which is supposed to be based in realism. This is most obvious with the bullies. The bullies pierce Nozaki with tacks, steal her possessions, push her into a ditch filled with garbage, call her names, attempt to shoot her with a crossbow, assault Nozaki's father on school premises with tack-studded shoes, invade Nozaki's home and ultimately set her house on fire with her family trapped inside. That's not all: it turns out that Nazoki's home-room teacher is the only recurring member of staff in the series and is revealed early on to be in cahoots with the main bully. All of this takes place within the opening three chapters, no less. Their motives? They did not want the new kid to be part of their graduation ceremony. Sorry, but that is utterly ridiculous. That 14-year-old kids could commit such reprehensible acts and not feel even an iota of remorse is too outlandish an idea for any critical reader to get behind. One simply can not suspend their disbelief while reading 'Misumisou'. None of the bullies have any redeemable qualities and little effort is made by the author to provide any sort of backdrop or fleshing out of these characters. There was one instance where a flashback was shown just before one of the bullies meets their fate, but it was awkwardly tacked on, almost as if an afterthought. Unfortunately, the rest of the cast do not fare much better. As the protagonist, Nazoki assumes the role of the innocent beauty turned killer. Nazoki's grandfather takes the role of the frustratingly ignorant relative. Aiba is Nazoki's only friend and also just so happens to be a psychopath. It may feel like these one-sentence descriptions are doing the characters a disservice, but in all honesty there is only so much one can say about what are effectively cardboard cut-outs. The mangaka doesn't give the reader much to work with: character development is non-existent and attempts at fleshing out come at a premium. In any other series, seeing the antagonists get their comeuppance would be cathartic, but not here. If the author doesn't put the effort in to making the protagonist likeable or the antagonists realistic, then why should the reader care about their fates? A good indicator of the quality of a cast of characters is how many of them you can remember by name and, in the case of 'Misumisou', it was just one. It is difficult to see any positives in what was a completely forgettable, unrealistic cast of characters. It's an extremely poor effort, it must be said. If the characters and contrivances of the plot didn't already kill the series off then the art made sure to finish the job. Honestly, the character designs look awful. Eyes are drawn too far apart, the faces are not drawn consistently from panel-to-panel and ultimately it never felt as if the mangaka was comfortable drawing his characters. There is also a disgusting expression that the mangaka draws on all of his characters when they are angry. Needless to say, it looks more amusing than it does threatening, at least until it begins to feel nauseating due to how grotesque it looks. While the character designs were a huge let-down, credit must be given for some of the backgrounds. In particular, there is one panel in chapter three where Nazoki and Aiba are drawn as silhouettes looking up at the starry night sky. It looks stunning, so much so that it feels out of place in a manga of this quality. The mangaka also appears to have talent for drawing weapons - lots of detail went into the crossbow and pistol. These instances are rare and it doesn't make a massive difference to the overall package, but it at least saves it from attaining the lowest possible marks. Overall, I went into 'Misumisou' with extremely low expectations and still managed to come away from it feeling disappointed. This was my first taste of Rensuke Oshikiri's work and chances are it is going to be my last. 'Misumisou' reads like an amateur's debut work, so to see that Oshikiri is an already established mangaka with a large body of work behind him came as a major shock. The characters are flat and unrealistic, the plot twists are contrived and the art is highly unpleasant, save for the odd panel here and there. I'm still not sure what message the mangaka was trying to convey, but in any event he failed. In all good conscience, I could not and would not recommend this manga to anyone. This manga was not bad, but it wasn't really all that good either. The setting seemed like a realistic small town, but it seemed like everybody in it was a violent psychopath. It seemed like this was supposed to be a message about bullying, but the middle school-age bullies are so cartoonishly evil that it's impossible to take the story very seriously. On top of that, (pardon the probable spoilers) the only villainous characters that ever show anything even remotely sympathetic or even human do so shortly before or as they die. The other reason this doesn't really work as a message about bullying is because most of the characters that are victims of abuse are just as bad, if not worse, than the abusers. I'm not even sure what the thing with the teacher toward the end was about, since it didn't actually factor into the story in any way and just seemed like trying to fill page space. Aside from that, the story did accomplish the goal of making the main character and her family sympathetic, even if the author had to go to insane lengths to justify what ends up happening. Despite that, I still ended up feeling bad about enjoying the later action, because I couldn't shake the feeling that on some level, this story was just the author's excuse to show children mutilating each other and the message about bullying was just a vehicle to make it a bit more palatable. The word I chose to describe Misumisou is "inconsistent", though it's possible to find this inconsistency functional for the plot, but perhaps I felt that only because of some narrative choices of the author being different than expected in most manga similar to this one. Don't get me wrong, I really enjoyed this manga. Please, allow me to explain. 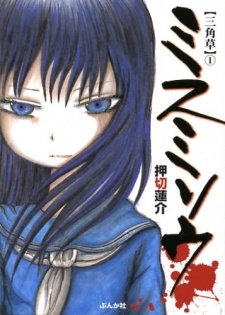 Starting with the story, what I tought would be just a manga about some girl dealing with bullying, turned out to be more centred on delibarate violance than anything, at least for some of the chapters. It's a story about revenge with students as main characters (sounds edgy but it's not THAT edgy). But regardless that, I can say that this is the least "inconsistent" part of the entire work. The art is slightly mediocre, to be honest, but when needed, it can delivers some really gorgeous, well done pages (plus the facial expressions are a pro to me, some shots turned to be really intense, I give this point to the author for using it as a functional resource), and the violent ones almost felt real. And just to be stated, I started reading mainly because of the visual stylization. For the characters, that 's the most incosistent part. Few characters will gain your individual attention, and most of them turned out to be almost just plot device, and some characters are there just because. But, like I said, the inconsistency itself turned to be working towards the plot. But what I really, really liked about Misumisou is that it's atmosphere and narrative worked very well to me. After I finished reading, I felt a menacing atmosphere around ME. When you combine the art and the plot, you have a "B" manga that turns to be really enjoyable. I realized that the exaggerated way the manga dealt with bullying was kind of well done, and perhaps you'll need some time to reflect to reach the same conclusion I've reached after reading. If you're looking for a tragical but not too much dramatical (I'm considering 'dramatical' different than 'intense') manga, this one worth it. Besides all that, the pacing is good and it has only 21 chapters, so, you should definitely give it a try, even if doesn't suits your tastes too much.